The boom trucks and the cranes are utility vehicles used for variety of tasks. They are very similar and usually they come with a cabin for the operator, an arm that lifts the boom and a loading bucket. Whether with a boom truck or with a crane, the worker can reach inaccessible heights very easily. The main function of these utility vehicles is to lift and move extremely heavy loads or equipment from one location to another. However, there are several things which make these machines different. A boom truck is equipped with a winch in order to lift loads, just like a typical crane. The boom trucks can lift loads of various sizes and weights, depending on the application. Generally, the boom truck, or the boom crane, is capable of lifting heavy and large loads because its size. However, the boom truck gains points due to its versatility, as it can easily maneuver around the job site. A boom truck equipped with a loading bucket can lift workers in high places to carry out a specific jobs, such as a maintenance work. Types of Boom Trucks – As there are numerous types of boom trucks, usually the term boom truck is used synonymously with some vehicles that have similar functions. 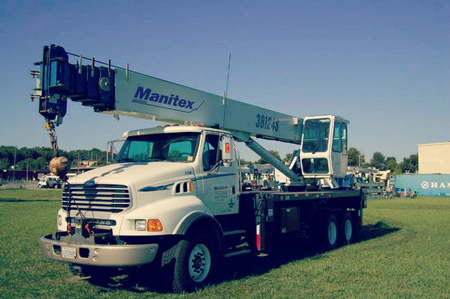 For example, typical utility trucks used for lifting workers or aerial work platforms mounted on trucks are very commonly referred as boom trucks. So, whether the boom truck uses a bucket or a winch, or tracks or wheels, it can still lift materials or workers vertically. 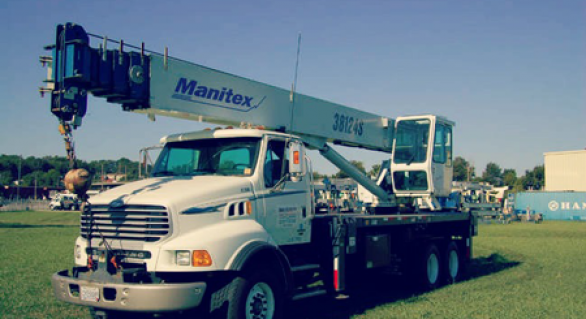 Boom Truck Crane – The most common boom truck is the boom truck crane, known as boom crane. This machine works as a typical crane and can be most commonly found in a construction area which is hard to access and which requires a heavy-duty lifting vehicle. A boom crane can lift weights of several tones and is very stable during lifting operations. Cranes are efficient lifting units that are used for lifting and moving heavy materials and equipment. Their advantages are widely recognized and are generally used in the construction sector, in manufacturing facilities and in the transportation industry. The cranes are composed of cables, ropes, chains and a winder. Every crane model has a different load and lifting capacity, depending on the type. Types Of Cranes – There are many different types of cranes on the market, but usually the cranes are classified as mobile and fixed cranes. The fixed cranes are those that are utilized in larger construction job sites for lifting heavier loads, as they are more stable. The mobile cranes on the other hand, are mounted on a set of tracks or tires and can be used on every construction job site for a variety of tasks. The mobile cranes are recommended for lighter loads.